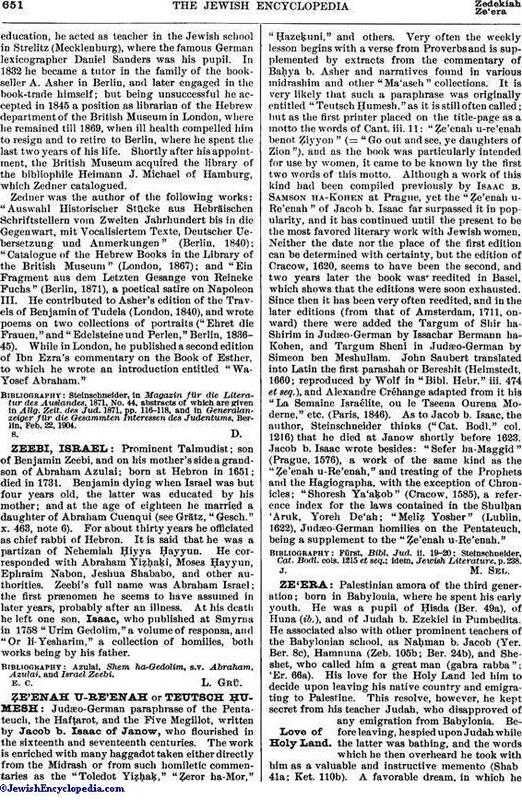 Prominent Talmudist; son of Benjamin Zeebi, and on his mother's side a grandson of Abraham Azulai; born at Hebron in 1651; died in 1731. Benjamin dying when Israel was but four years old, the latter was educated by his mother; and at the age of eighteen he married a daughter of Abraham Cuenqui (see Grätz, "Gesch." x. 463, note 6). For about thirty years he officiated as chief rabbi of Hebron. It is said that he was a partizan of Nehemiah Ḥiyya Ḥayyun. He corresponded with Abraham Yiẓḥaḳi, Moses Ḥayyun, Ephraim Nabon, Jeshua Shababo, and other authorities. Zeebi's full name was Abraham Israel; the first prænomen he seems to have assumed in later years, probably after an illness. At his death he left one son, Isaac, who published at Smyrna in 1758 "Urim Gedolim," a volume of responsa, and "Or li-Yesharim," a collection of homilies, both works being by his father. Azulai, Shem ha-Gedolim, s.v. Abraham, Azulai, and Israel Zeebi.